1. Weleda Skin Food Saviour – £9.95 at Weleda. Weleda Skin Food is an old favourite of mine, it’s a lovely nourishing and hydrating treatment for the whole body, offering intense hydration for anywhere that needs it – especially the hands, feet and elbows. The Skin Food formula has been around since 1926, so it’s definitely stood the test of time! This kit includes a cotton flannel which you dampen with warm water and place on the face to help open pores, then apply a think layer of Skin Food and remove with the flannel after 10 minutes. This is an inexpensive, easy and effective way to get super soft and hydrated skin. 2. Thalgo Extreme Comfort Cream – £45.00 at Thalgo. If you’re looking for a more luxurious product, you must try Thalgo’s Extreme Comfort Cream. This is specifically designed to nourish dry skin, providing an intense feeling of instant and lasting comfort. The Extreme Comfort Cream is an exceptionally rich cream reinforced with Omega-3 & Omega-6 fatty acids and restructuring oils to help repair the skin deep-down, giving the skin a luxuriously moisturised feeling. It’s repairing, soothing and calming, and this cream also helps protect the skin from visible signs of ageing. 3. Yes Nurse Hand Cream – £8.49 from Yes Nurse. If hands are you problem area, Yes Nurse offers a fantastic and affordable solution. The Yes Nurse Hand Cream combines Omega 3, 5, 6 & 9 and Vitamins A, B5 & E to soothe inflammation, hydrate skin cells & repair dry and cracked skin whilst locking in moisture, leaving you with noticeably smooth & nourished hands. I love that this product doesn’t leave you with a greasy, slimy feeling like you can get from many hand creams. 4. 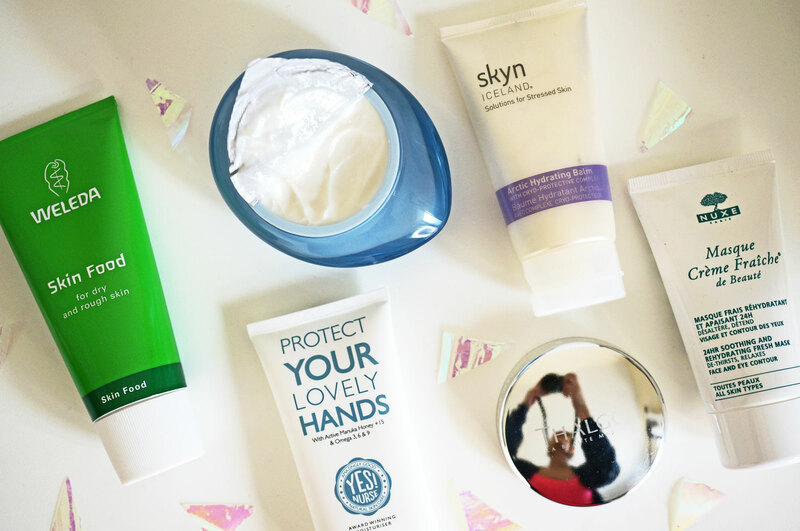 Skyn Iceland Arctic Hydrating Balm – £25 from Marks and Spencer. This Arctic Hydrating Balm is a deeply reparative moisturising skin replenisher, harnessing cryogenic technology from the Arctic and Antarctic to soothe and repair super dry and sensitive skin. It contains Antarticine which is extracted from an Antarctic glacier to help prevent damage, Red Arctic algae, which soothes skin and fights free radical damage for healthier tone and texture, Gooseberry extract to regulate skin temperature, and an Arctic oil blend to help soothe skin. This really is a super thick and intense cream, I love to use this when my skin is particularly dry and unhappy. 5. Nuxe Creme Fraiche De Beaute Mask – £18.50 from Nuxe. I’ve tried a few of Nuxe’s products now and they’re definitely a fantastic affordable skincare option, the Crème Fraîche de Beauté Mask is a lovely, refreshing face mask that can be used once or twice a week to rehydrate and revive tired skin. I’d also recommend storing it in the fridge, for extra cooling refreshment! I’d love to hear what you think? And if you’ve tried any of these products? Eat Yourself to Healthy Hair + Giveaway! The Budget Cosmetics You NEED For Autumn! Next Post Introducing Versace Eros Pour Femme EDP + Giveaway! I had a good buy from TK Maxx recently of facial oil that feels really nice on my skin. This is perfect timing, I have really dry skin on my face and need to get soemthing to help!! Thank you.